A superb example of contemporary furniture with over 60 classic arcade games! 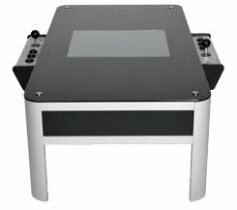 A state of the art piece of furniture with in-built gameboard including 60 classic arcade games! The Millennium Table is a hi tech, handcrafted contemporary design coffee table, designed for use in any of the ways you can imagine a superb piece of furniture such as this can be used - showing off your coffee table books to impress your friends, putting your feet on while watching TV or a film, or even...putting your coffee on it! The Millennium Table features a sculpted powder coated aluminium frame, moulded stainless steel controllers and wooden side panels that make it a stand out piece of furniture in any room. The toughened 6mm glass surface combines good looks with durable, hard-wearing quality. Of course the most important thing about the Millennium Table is that you can play classic arcade games on it, with its built in gaming board that has been preloaded with 60 retro favourites including Space Invades, Pac-Man, Asteroids and many more! 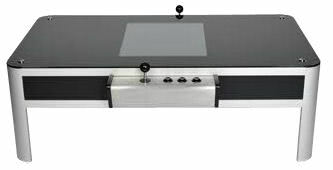 And what better way to view these games than a 19 inch wide angle LCD screen that gives a perfect picture from any view.